Whether you’ll be getting a jump start at the beginning of term or fearfully watching the clock tick towards a major deadline, all students find themselves in the university library at some point. In the past, libraries have often gotten a bad reputation as being quiet dungeons patrolled by militaristic staff, although the thrill of having a romantic liaison quietly between the shelves has brought students of all sorts back into the fold. All stereotypes aside, libraries are fantastically useful resources for students – if you know how to use them. Don’t miss out on this professional, organised, efficient, and most of all FREE resource any longer. Get thee to the stacks! It may not involve electric guitars or sequinned jumpsuits (which, we can probably all agree is for the best!) 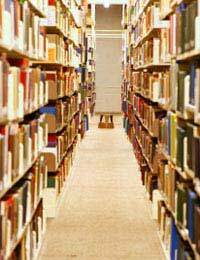 but the library tour is the best way to make yourself familiar with the resources at your disposal. Go to the library the first week of term when signs will no doubt be plastering the walls advertising tours, or just pop in to the enquiries desk and ask. When you do turn up for your tour, make sure you grab a copy of any handouts that are on offer and highlight areas that will be important for you. If something isn’t mentioned on the tour, go ahead and ask. The only bad question is the one that is never voiced! Front cover, which will list at least the title and author of the source. Back cover, which will usually carry a blurb about the source and the International Standard Book Number (ISBN) near the bar code. Inside of the back cover which often provides a short biography of the author. Title page, which usually lists the author, title and publisher. Back of the title page, which offers bibliographic information including author, title, publisher, date of publication, place of publication, date of copyright and edition number is usually found on the back of the title page. Glossary or small dictionary of terms that may be provided near the back. Index, which lists the subjects covered in the book as well as the page numbers on which you can find them. Further reading section, which is often very helpful in providing you with other resources to use in your research. Bibliography, which again may quickly point you to further sources. The bad news about honing your library skills is that becoming comfortable in the library and finding information on the shelves and in the resources can take time. The good news is that a little practice goes a long way, and the best news is that university libraries are always staffed with professionals whose job it is to help you. Make the most of your library and friendly librarians while you can, and when you graduate with honours be sure to send a little thank you card!